Link light-rail trains will run only six minutes apart at peak, instead of every 7.5 minutes, starting Monday. Starting Sept. 28, light-rail trains between Seattle and SeaTac will show up every six minutes at peak hours, adding capacity to the 16-mile Link corridor. Because more trains will be added, some buses that currently use the Downtown Seattle Transit Tunnel must be diverted to surface streets. 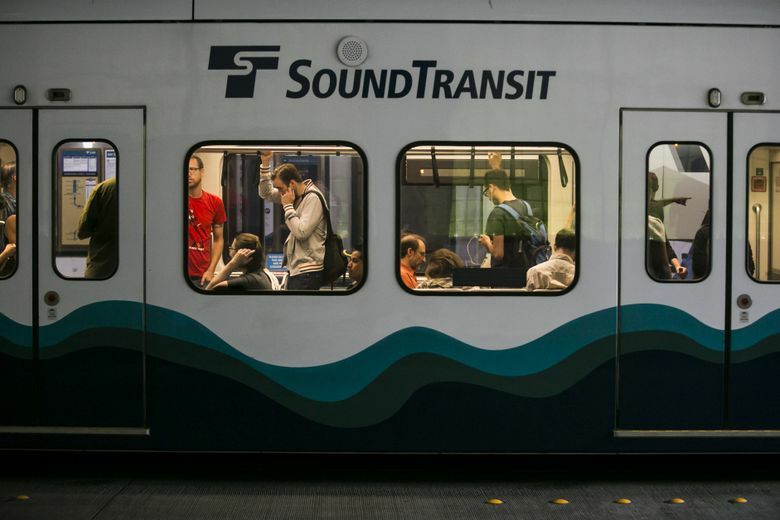 Sound Transit tweeted an announcement about the new schedule Wednesday afternoon. Currently, trains arrive 7½ minutes apart during peak-time commutes, and 10 minutes apart most other hours. The main reason is to prepare for the opening of the University of Washington and Capitol Hill stations sometime in the first quarter of 2016, bringing a ridership surge from students, staff, hospital workers, sports fans and hill residents. By December 2015, trains will go all the way to UW, without passengers, as a way to prepare for a longer system and more trains on the line, before passengers pour in. “It’s all to be as ready as we possibly can for when U Link opens,” said transit spokesman Bruce Gray. He said the agency long ago decided to boost frequency beforehand. King County Metro Transit said it must move six bus routes out of the downtown tunnel, to create space for more trains. Those are routes 76, 77 and 316 that serve North End destinations via Interstate 5; and buses 216, 218 and 219, which continue onto Interstate 90 to the Eastside. All buses are supposed to leave the tunnel by 2021, when Link stretches farther, to Northgate Station. However, transit staffers have talked about whether to make the transition sooner. The six-minute train frequency extends all the way to the Seattle-Tacoma International Airport. Peak times are 6 to 8:30 a.m., and 3 to 6:30 p.m. Drivers seeking to cross Martin Luther King Jr. Way South, as well as the Sodo transit way at South Lander Street, can expect more red lights, as trains take priority two more times per hour. But the general signal sequence and crossing designs won’t change. The initial Westlake-SeaTac/Airport Station train corridor opened six years ago, and ridership has steadily grown to 40,442 average weekly boardings, as of July. The $1.8 billion Capitol Hill Tunnel to UW, as well as a new $383 million Angle Lake park-and-ride station — to open next year south of the airport — are projected to add 16,600 boardings by 2017. Bus riders will see other changes, starting Sept. 26-28, including 34 Metro routes within Seattle with revised or more frequent service, funded by a voter-approved $60 city car-tab fee. Another 21 route changes are planned countywide — among them, an increase in off-peak trips for the popular RapidRide E Line on Aurora Avenue North, to run 10 minutes apart instead of every 12 minutes. Unlike quite a few Metro buses, which are dominated by downtown commuters, the E serves a steady clientele all day, in both directions, running errands throughout Shoreline and North Seattle.